This shrub is rarely seen in gardens or for sale at nurseries, but is well worth considering if you would like an unusual and attractive medium shrub. The four petals on the bright white flowers, which appear from spring to midsummer, are paired in such a way that it appears as if each bloom has only two petals. By early fall the berries begin to colour up and turn from mahogany brown to almost pure black, and persist well into the winter. Height and spread 5 feet. For maximum freshness, please keep seed refrigerated in its original packaging until it is time to plant. Seed should be sown in autumn in containers and allowed to stratify naturally over the winter. If you wish to make a spring sowing, store the seeds for six week in damp sand in the refrigerator before sowing. Seed should be sprinkled lightly with enough soil to just cover them. 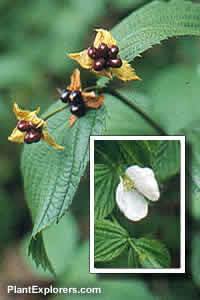 Grow in moderately-fertile moist but well-drained soil in full sun or partial shade.